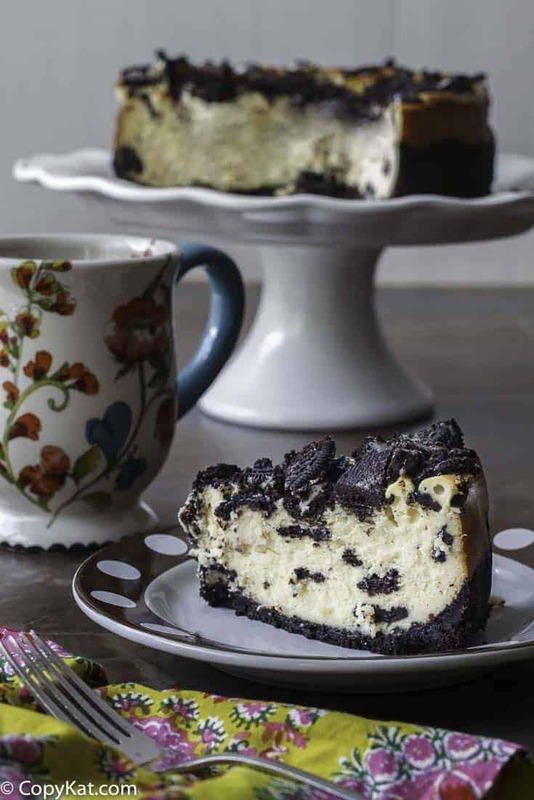 This Oreo Cheesecake is a creation of the Cheesecake Factory—they know their cheesecakes. It is one of my personal favorites. You can’t go wrong with this one. Who can turn down a cheesecake with Oreo cookies? The Cheesecake Factory is known for their many delicious recipes. Their menu is vast and is sure to please everyone that goes there. 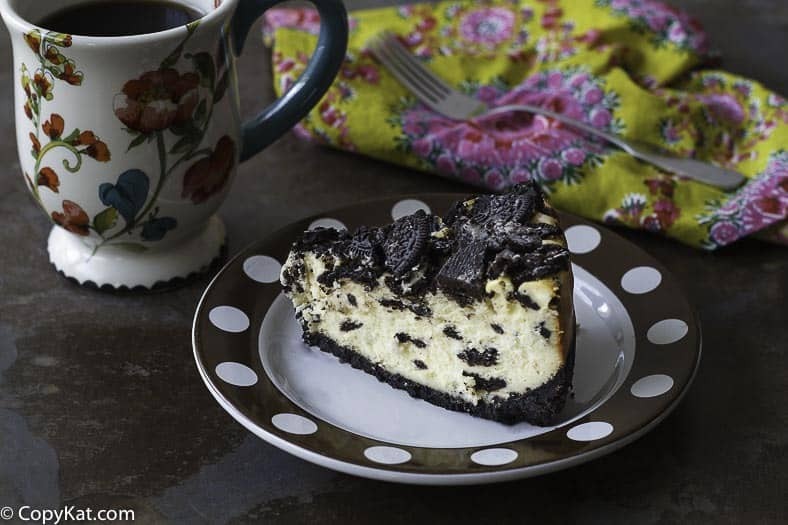 One of their standby cheesecakes is their famous Oreo cheesecake recipe. You can recreate this recipe at home with this recipe. If you have never made a cheesecake before, they aren’t too difficult to make. As with many baking recipes you need to follow a few simple guidelines to have success at making your cheesecake. Here are my tips for making a great cheesecake. All ingredients need to be at room temperature before you begin. And keep the mixer on a low setting during the mixing and beating process. Do not over-mix the cheesecake; it will fall if too much air is whipped into the cheesecake. Mix only until ingredients are incorporated. Beating a cheesecake for 2 or 3 extra minutes is not helpful. Cheesecakes may not be fully set when removed from the oven – this is OK. The cheesecake may have a slight wiggle in the center when you remove it from the oven. The cheesecake will continue to set up after you remove it from the oven. It will firm up as it cools. To prevent cracking when the cheesecake cools run a knife around the edge of the pan to loosen the cheesecake from the springform pan. Once the cheesecake cools completely remove the springform pan, it is important to wait until the cheesecake sets up completely. Is a Waterbath Necessary for this Oreo Cheesecake? It is not necessary it is highly recommended. Please consider using a water bath for this recipe. It helps to moderate the temperature of the oven. Most ovens do not heat continually; they cycle between not heating and then heating to maintain the temperature. Ideally please use the 9-inch sized pan, this is the size of the pan this recipe was developed. If you desire to use a different sized pan, your cooking times will vary. How many Oreos do I use? We are using Oreo cookies in three different measurements. For the crust, you need to crush the cookies before you measure them. For the batter, you will use six cookies, and for the top of the cheesecake, you will use eight cookies. 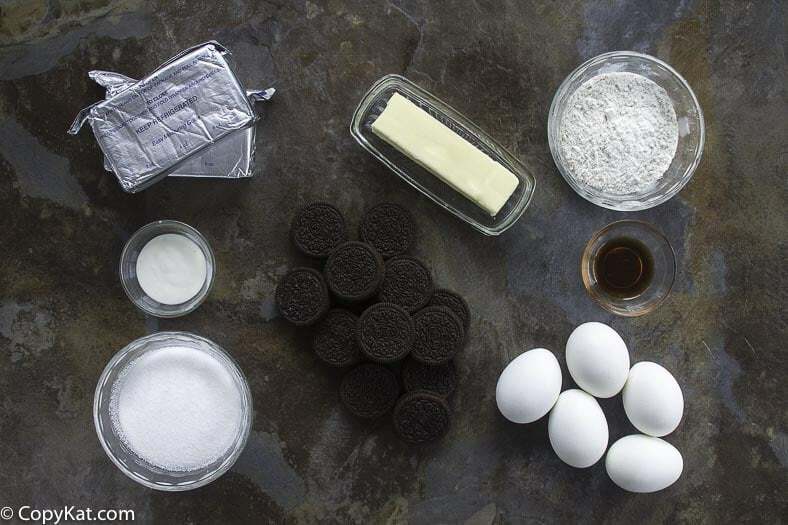 Recreate the famous Oreo Cheese from the Cheesecake Factory at home. Crust Mix melted butter with Oreo crumbs and press in a 9-inch spring pan cover the bottom and 1 1/2" up the sides with crumbs, set aside. Note, you do not remove the filling of the cookies when you make crumbs out of them. Leave the filling in the cookies when you crush them. All Ingredients need to be at room temperature before beginning. Beat cream cheese until light and fluffy (You can add the 1 cup of butter as listed as an optional ingredient). Keep mixer on a low setting during the mixing and beating process. Add sugar gradually and continue beating cream cheese until mixed through. Add eggs one at a time and continue to beat until blended. Measure the vanilla, salt, and flour, pour into the cream cheese and egg mixture and beat until smooth. Add the sour cream and beat well. Turn off the mixer and stir in the six coarsely chopped Oreo cookies with a spoon. Pour cream cheese into the spring form pan and place the 8 coarsely chopped Oreo Cookies on top of the cream mixture. Place pan on the top rack and in the middle of a preheated oven at 325 degrees and bake for one hour. The Cheesecake will be done when it jiggles slightly in the middle when the pan is gently shaken. If the cheesecake is very jiggly, then cook for an additional 15 minutes. When time is up prop the oven door open and let the cheesecake stay in the oven for one hour. The oven should be turned off at this point. Please note there is an additional 1 cup of butter that was added to the batter when I made it for the video. This is an optional ingredient. It simply adds some extra richness to the cheesecake. You can leave it out, or add it as I did for the video. This recipe was developed for a 9-inch baking pan. Just wanted to thank you. I made the recipe just as you described and everyone loved it. I have been making this recipe for years it’s always a hit. Follow the recipe or skip the Oreos and do a traditional graham cracker crust. Either way it’s amaz!!! People who swear they hate cheesecake love this one. Thank you so much for posting this!!! Oh wow, that is a pretty strong endorsement! Thank you! My cheesecake is in the given right now. I can’t wait until tomorrow to try it! This cheesecake is perfection!! Followed all instructions and it came out perfectly. Thanks so much!! Thanks a bunch for this recipe! I will make it again tonight! HI, in your video , you added the butter with the cream cheese , Michelle upchurch asked the question , and u said to melt it and pour in , also u never used a water bath in the video , could u please clarify , thanks. What temperature should the water in the water bath be when it is first put in the oven? I made this recipe with a graham cracker crust. It turned out so good. Rave reviews from my family.